The inner city suburb of Sendagaya lies between Harajuku and Shinjuku, two well-known Tokyo destinations. It almost never features on the Tokyo To Do list, which is a shame because Sendagaya is Tokyo when no one’s watching. It’s more behind the scenes than in the spotlight — a great place to escape the crowds and chaos of the neighboring ‘jukus. While there are specific points of interest (such as the beautiful Tokyo Metropolitan Gymnasium – an excellent example of retro-futuristic design), what I really love about the seemingly residential area is its double identity as a secret hive of activity and quiet industry. You see, Sendagaya is home to numerous design workshops and studios, hidden away in converted apartment buildings. It’s also the location of myGengo headquarters – where I work – and therefore, where I eat. So, you can imagine my delight (and relief!) 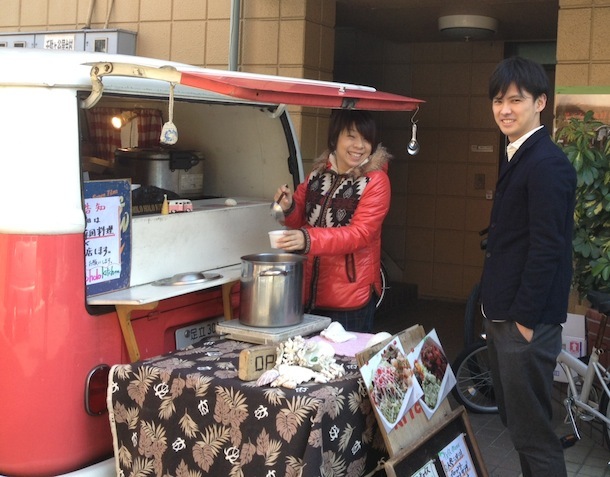 in discovering that Sendagaya, in addition to being a hub for designers, developers and other creative types, is a popular destination for lunchtime food trucks. I first stumbled upon the advent of food trucks while holidaying in LA in 2010 and became an instant fan (read last week’s post by Crystal for her list of favorites there.) Things are done a little differently here – there are established “spots” and rotating schedules – but the basic premise is the same: food from a truck. Last week I set myself a food truck challenge – 5 days, 5 trucks, 5 bentos. Here are the results. Holo Holo Kitchen’s (pictured above) specialty is taco rice, an eccentric combination of taco-flavored ground beef, lettuce, tomato, cheese and rice. The dish was born in Okinawa, which might explain the island-theme of this colorful truck. Holo Holo’s taco rice bento is an ugly-looking medley of all of the above plus mayonnaise and chili sauce. Very scrummy but not for the faint-hearted or health conscious. I don’t have much to say about Sicilian Rice other than – crumbled Doritos, mayonnaise and miso sauce?? What on earth were you thinking?! Food truck fail. Xmas Santa Chicken (XSC) is a myGengo favorite for its generous servings of roast chicken on the bone – a dish that is hard to come by in Japan and usually reserved for Christmas time (thank you, KFC! ), hence the name. Thanks to XSC’s built-in rotisserie, my chicken was delightfully warm and crispy-skinned. Served on a bed of rice with a side of steamed bean sprouts. Papagaya Deli’s falafel bento came a close second to Kankoku Gohan’s bibimbap. Papagaya is a relative newcomer to the Sendagaya food truck scene and is charging up the popularity ranks for its hearty lunch set – a bento of fresh falafel, couscous, fried eggplant, pickles and salad with a spicy chicken, chickpea and veggie soup. Yummo! Papagaya is a breath of fresh air and hopefully here to stay. Check out the Sendagaya Food Truck Map for a Google Map showing featured trucks. This entry was posted in Taste, Tokyo and tagged explore, natalia, taste. People don’t generally associate Tokyo with food trucks so this is a great local tip into the city. Doesn’t seem to be that many veggie options though. Will vegetarians have issues traveling Japan? Yum, this made me hungry. :) It would be great to figure out where the food truck phenomenon started. In terms of veggie options, I’m not sure but I’ll investigate and report back! In general, Japan is not ideal for vegetarians although there are a few fantastic places here and there..